Bonne année, mes amis! Happy New Year, friends! The semester and the holiday madness are over, so now I get to give you guys some updates! 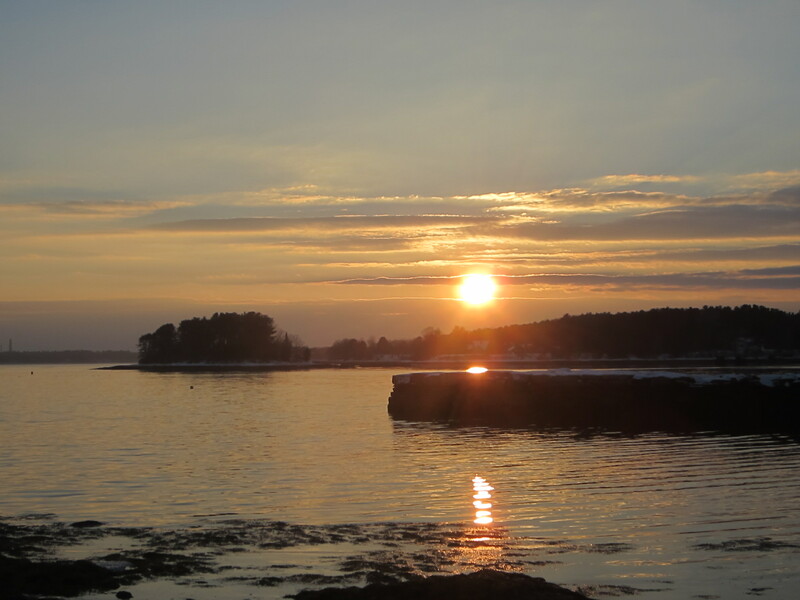 I spent last weekend in Freeport, Maine for a family reunion. This is the third year (not in a row!) 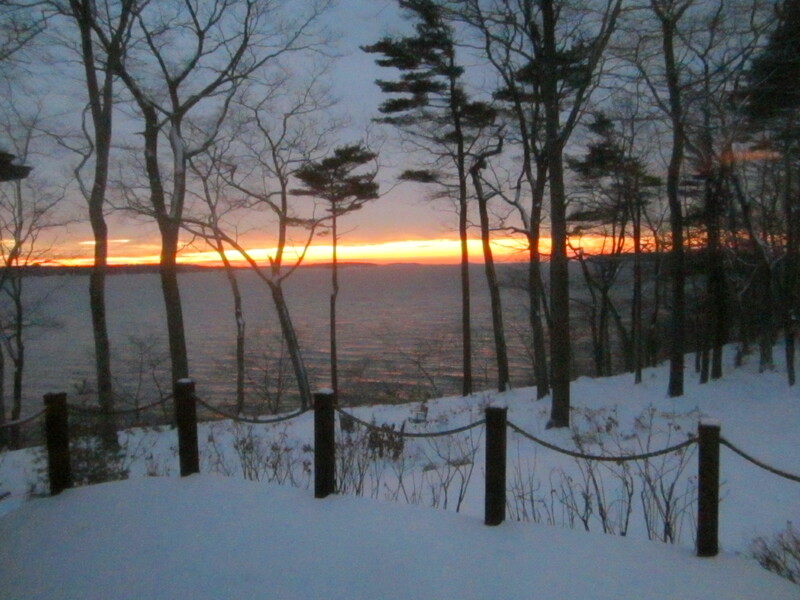 that my dad’s family has had its Christmas shindig in Maine. My uncle, who lives there, has rented the same house on the bay every year, although this year, we had to rent two houses because there were almost 30 of us! Yep, it’s a party. The Basics: Freeport is located on Casco Bay and is nicknamed “The Birthplace of Maine.” Today, it’s best known for its outlet shopping, which may make travel snobs groan, but many of the stores are housed in historical buildings, such as the Abercrombie and Fitch outlet that lives in the former public library. (I’m not thrilled about it either, but at least they preserved a historical site and Freeport still has a community library.) In 1912, Leon Leonwood Bean opened his first store in Freeport Corner, one of the four original villages that developed into the town. The L.L. Bean flagship store and corporate headquarters are still located in Freeport. 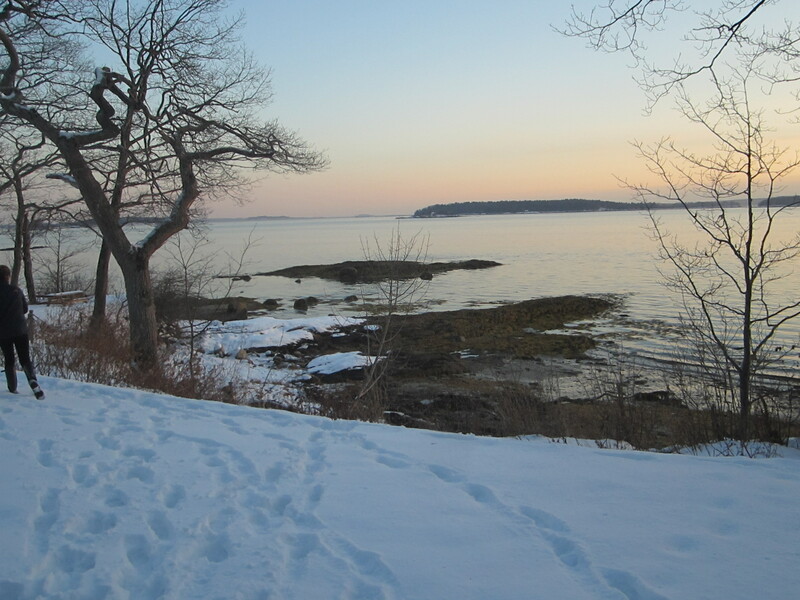 If you’re like my dad and hours of shopping make you cringe, the town is also home to Wolfe’s Neck Woods State Park, which offers the most beautiful sunrise ever over Casco Bay. Vicky’s Itinerary: I didn’t get to do too much tourism as I was, you know, doing family stuff. However, I will share with you a few highlights, starting with waking up at 6:30 a.m. on Friday with my grandma to catch the sunrise. This is the view from the first-floor dining room in the second, smaller house I was staying in. You can’t argue with this! The backyard of the main(e) house. Ha ha. Puns. I caught the sunset later from the other house. Gorgeous, right? And after a day or two of Christmas presents and pierogis — in case you can’t tell, it’s my Polish side — my immediate family hit Main Street for some shopping! 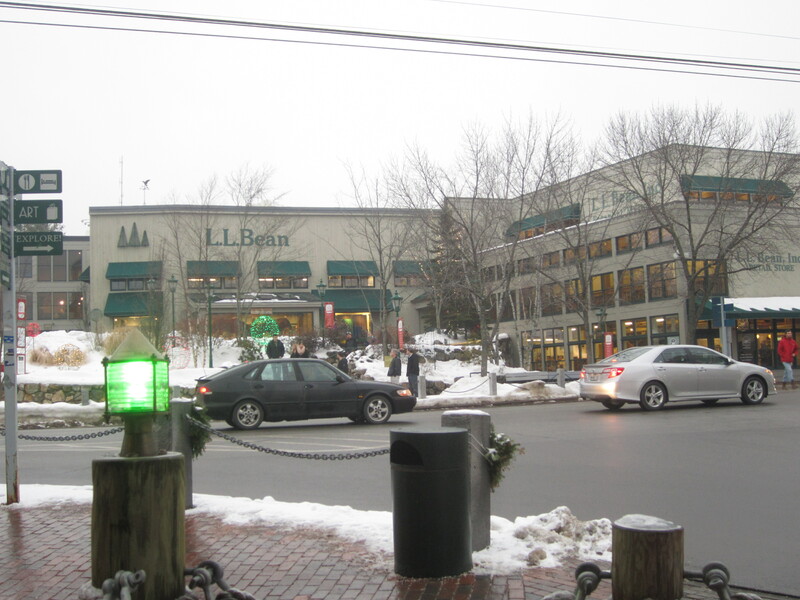 A view of the L. L. Bean flagship store from Linda Bean’s Maine Kitchen and Topside Tavern, founded by Leon’s granddaughter. The store has a gigantic sculpture of the famous Maine Hunting Shoe (aka the Bean Boot, not pictured.) I got my first pair of brown Bean Boots on my first trip to Freeport in 2010. 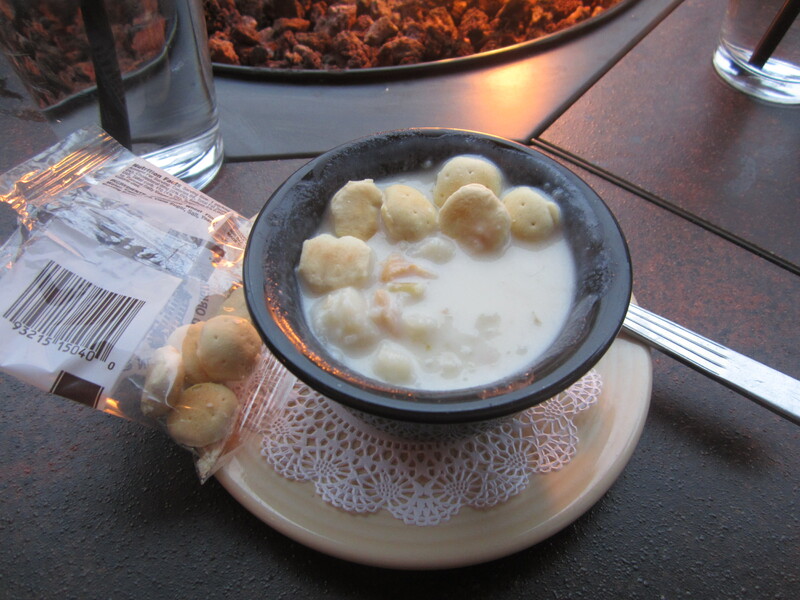 … CHOWDA! This bowl I had at Linda Bean’s, but there are several clam chowder and lobster places lined along Main Street. In the great debate of chowda, I am so Team New England. Sorry, Manhattan. Hidden Treasure: Need a shopping pick-me-up? WALK PAST THE STARBUCKS. WALK PAST IT. Continue down Main Street in the opposite direction of L.L. Bean, and about 800 feet away, you’ll see a sign shaped like a donut. It’s Frosty’s Donuts, which has made hand-cut donuts since 1965. My favorite is the maple cream donut. Mmmmm. Stay tuned for more Postcards From … as I travel in 2014! Thank you for reading, Michelle! I hope you do make it up there!